It was announced last week that Gene Sharp has passed away. If you’ve never come across the work of Sharp you should. He was one of the most important writers, thinkers and strategist on nonviolent resistance. Tim Gee has written this really nice reflection on his work and legacy. 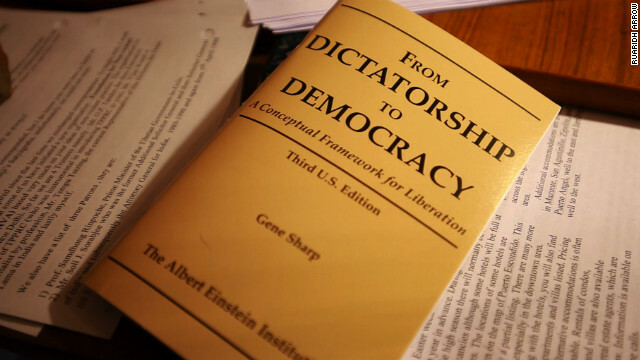 The short pamphlet that he is most well known for is ‘From Dictatorship to Democracy’ which was translated into over 40 language, and part of his many writing that influenced numerous movements around the world, including those like CANVAS in Serbia who overthrew Slobodan Milošević, many of those involved in the Arab Spring movements and many many more. But there is a richness in his work that’s applicable for any campaigner, so I wanted to share some of three tools that Sharp developed or inspired that I’ve found especially useful to consider in campaign strategy. 1. Pillars of Support – Traditional power is thought of as a pyramid, where power flows from the top downward, but Sharp suggested that as activists we should turn the pyramid upside down, and see that power is ultimately dependent on the cooperation and obedience of large numbers of people acting through the institutions that constitute the state. These are its pillars of support. This is a brilliant case study of how the model can be applied to the movement for equal marriage. See more on this approach here and here. Too often I think campaigners focus on changing the position of the government, but Pillars of Support reminds me that sometimes looking beyond that can lead to impact. 2. 198 Methods of Nonviolent Action – The most comprehensive list I’ve ever come across of the “entire arsenal of nonviolent weapons” at the disposal of change makers. Sharp listed almost 200 different approaches and classified into three broad categories: nonviolent protest and persuasion, noncooperation (social, economic, and political), and nonviolent intervention. If you’re ever looking for campaign tactic inspiration this is a great place to start. 3. Spectrum of Allies – In campaign strategy we can too easily focus on those who are already supportive or those who are opponents, and so our campaigns are planned in a very binary manner. 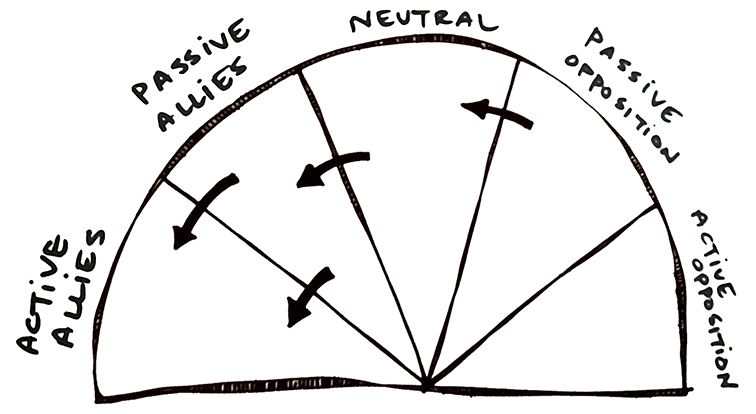 The Spectrum of Allies recognises that often many groups are in the middle, or those whose support or opposition is softer than it might appear. The goal of the spectrum of allies is to identify different people—or specific groups of people—in each category, then design actions and tactics to move them one wedge to the left. Once you’ve identified where different groups sit then you can start to think about how you can engage them in your campaign. See more on this approach here and here.